We didn't even know that Pluto existed until the 1930's. Astronomers studied the orbit of other planets in the area and noticed a little wobble. The wobble was big enough for astronomers to start looking for a source. Eventually Clyde Tombaugh found Pluto. In recent years, additional large bodies have been discovered just beyond Pluto's orbit. For such a small object, there is a lot of debate about Pluto. Its size is one of the big reasons that astronomers stated that it is no longer considered a true planet. The International Astronomical Union (IAU) met in August 2006 and decided that Pluto would be classified as a dwarf planet. The change comes because of Pluto's size and eccentric (strange) orbit. It passes in an out of the orbit of Neptune and doesn't orbit in the same plane as the other planets. It's a weird little object. Astronomers decided that this weird little object would no longer be a planet. Even though a small object, Pluto has its own satellite (moon) named Charon. If you say the distance from the Earth to the Sun is 1. 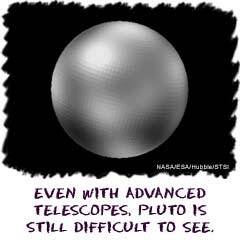 Then the average distance from Pluto to the sun is 39.5. That is a really long way. When you are an object that far away from the Sun, you are missing some things. First, there will be very little light. Second, you will get very little energy from the Sun and your planet is going to be mighty cold. Scientists speculate that the average temperature on Pluto is 37 Kelvin. Ice freezes at 273 Kelvin. Brrrr. Pluto's orbit is also special. It crosses Neptune's orbit and is closer to the Sun for several years at a time. This more elliptical orbit has scientists wondering if it is really the largest object in the Kuiper Belt. The Kuiper Belt is the home of thousands of small objects that orbit the Sun beyond Pluto. The recent decisions by the IAU will term many round bodies to be called dwarf planets. So is it a Jovian or terrestrial? Gas or rocky? Right now, it's neither. If you had to force it, lean towards terrestrial. The Pluto's diameter is only about 60% the diameter of the moon. It is so small that it is able to rotate once every six days. Even though small and incredibly cold, astronomers believe it has a very thin atmosphere of nitrogen. In January of 2006, the New Horizons mission launched to study Pluto and objects in the Kuiper Belt. The spacecraft should reach Pluto by 2015 and the Kuiper belt in 2016.